The purpose of this chapter is to describe the innovative Dissertation-in-Practice model being implemented in the University of Missouri Statewide Cooperative Doctoral Program in Educational Leadership (EdD Program). This doctoral program develops scholarly practitioners who are able to address critical problems of practice through the use of theory, inquiry, and practice-oriented knowledge. While these skills are utilized to create purposeful, professional products throughout the program, the redesigned Dissertation-in-Practice at MU is intended to further showcase the impact of the students' work as scholarly practitioners through dissemination-ready components. 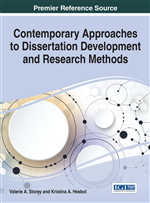 The chapter includes the history of the program and a description of the process through which program faculty redesigned the dissertation from a traditional five-chapter model to its current six section form. This restructuring, which includes dissemination to scholars and practitioners, is detailed. The chapter concludes with emerging supports for the scholarly practitioner graduates. In the mid-1990s, several deans of Education from around the state of Missouri began to explore the possibility of having a statewide educational leadership program. Beginning in November of 1995, a task force met and developed the foundation of the Statewide Cooperative EdD Program. This included conducting a needs assessment in 1996 that resulted in the identification of over 600 prospective students. In August of 1996, the Board of Curators endorsed the proposed program. Then, as stated by Mountford, Ehlert, Machell, and Cockrell (2007), the program was “approved by the Missouri Coordinating Board for Higher Education in 1996 as a collaborative venture supported by a $1.8 million annual line item budget” (p. 193). This history of state-level funding, combined with the statewide cooperative focus of the program, contributes to the continued programmatic mission to serve the state of Missouri, and surrounding areas.